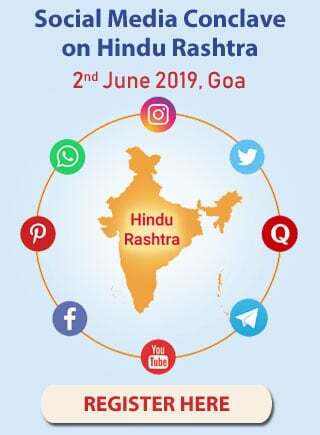 How to perform Shraddha ? Home > Spirituality > Gurukrupayog > Chanting > How chanting purifies the mind ? How chanting purifies the mind ? The spiritual practice of chanting is very simple. Chanting God’s Name helps in alleviating physical and psychological ailments, increasing concentration, reducing sorrow, nullifying all sins, and is useful even after death. Chanting helps to purify the conscious as well as the sub-conscious mind. Meaning: Man makes a resolve mentally and then through his speech, he spells it out. In meditation, whatever comes to him through his mind, he speaks. Thus, the lines above prove that remembrance and meditation are a part of Namasankirtan (Singing praises, glory of God or chanting God’s Name). Clarification : We remember God in our mind and hence chant. While chanting, remembrance of God takes place naturally. When we start developing an introvert attitude (from being an extrovert), it means we are progressing. 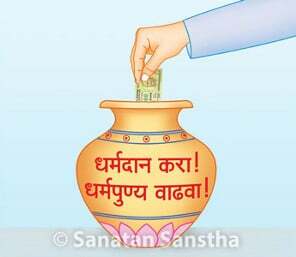 By chanting, our inclination towards the materialistic world reduces considerably and we begin to delve within ourselves. This helps us in developing an introvert attitude. Just as the sun destroys faeces as well as its odour, the radiance generated by chanting God’s Name destroys the internal impurities. According to psychology, chanting God’s Name and that of a worldly object are quite similar. When a mother utters or hears her son’s name, numerous emotions arise in her subconscious mind. These could be motherly affection, happiness, worry, aspirations etc. This is because all emotions associated with the name of the object, that is, the son, co-exist. The memory of or hearing that name constantly activates the emotions. This is spontaneous and is a powerful driving force in a mother’s life. Sometimes, due to this very force a mother is prepared to sacrifice everything for her son. The psychological response in chanting God’s Name is the same. When we chant His Name, we have some emotion or image about God, consciously or unconsciously. We also have some notion about His qualities. We know from discussions that we benefit from God’s grace and that chanting His Name is the tool to acquire the grace. 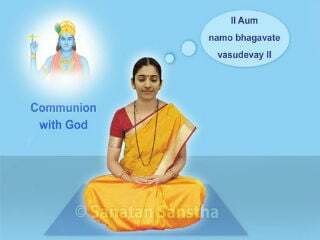 Hence, the bhav (Spiritual emotion) that we are chanting God’s Name, who has distinguished qualities, accompanies God’s Name. Due to this very bhav, emotions such as respect, love and devotion for God, fear of wrong actions etc. go on increasing progressively; while emotions, on the other hand, keep diminishing. Thus, gradually the subconscious mind gets purified. 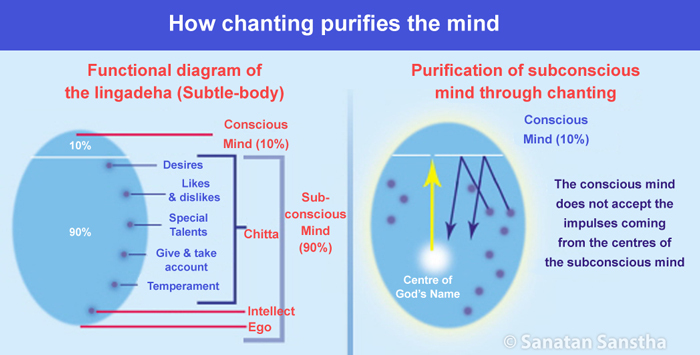 When chanting is going on, the conscious mind does not accept the impulses coming from the centres of the subconscious mind, such as desire and instinct centre, like and dislike centre, temperamental characteristics and the intellect centre. When this continues for long, gradually the old impressions in these centres start decreasing. So long as chanting goes on, new impressions about other things do not develop on the subconscious mind. 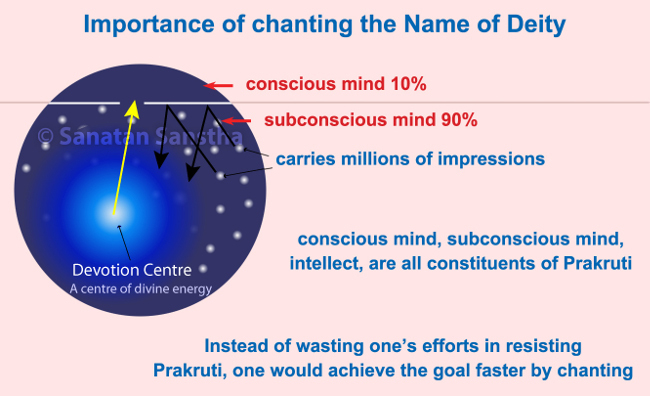 Chanting God’s Name is perhaps the best way in a conscious state to prevent new impressions from developing in the subconscious mind. (In the states of dharana [Concentration], dhyan [Meditation] and samadhi [A superconscious state of meditative union with the Absolute God Principle] too, impressions about other things do not get created on the subconscious mind). When there is dehabuddhi (Body-awareness), desires exist. Also, the reason for our dissatisfaction and moroseness is the consciousness that we are this ‘body’ and the constant use of our sense and motor organs. However, with chanting, the mind is less distracted by the attractions outside. When this straying of the mind reduces, automatically the desires lose strength. Later, the mind gets engrossed in chanting God’s Name. Instead of satisfying desires, the mind gets absorbed in chanting. Thus, the desires reduce and eventually fade away. Since desires are subtle in nature, they require subtle means to eliminate them, that is, God’s Name. While chanting on 15th and 16th January 2004, I started blabbering with the impression that some event was taking place. I asked God (through the subtle) ‘What is happening?’ He replied ‘Your condition now is like that of a drunkard. You are blabbering from within just as a drunkard does. Since you are chanting at the same time, the internal thoughts which are being expelled are getting destroyed’. After chanting I felt rejuvenated. How different chants can help avoid unfavourable incidents ? How does chanting help us to achieve oneness with God? How does chanting ofGod’s Name continuously ensureHis remembrance during the last breath ? How Chanting benefits us at Physical and Psychological level ? 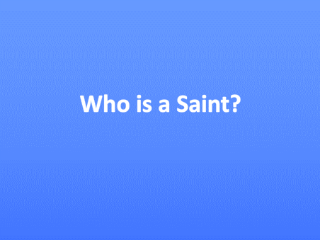 Who is proclaimed a Saint as per Science of Spirituality ?